This is gorgeous and really very clever! What an amazing idea....you go girl!!! Amazing! A magazine of 1965? Do you keep all your magazines or do you just tear out pages you think you might use one day and how in the world do you organize them? Beautiful card. You never stop amazing me Ro. Lovely! I like the vertical sentiment. I love that you think of so many interesting ways to make your cards. Love the softness of the image that his highlighted by the black card base. Pretty card. What a sweet card with the soft colors and image; I'm so impressed that you're finding these images from old magazines - what a wonderful idea!!! So pretty ....I love the soft papers and the lettering is perfect ! So very beautiful with the soft color palette. 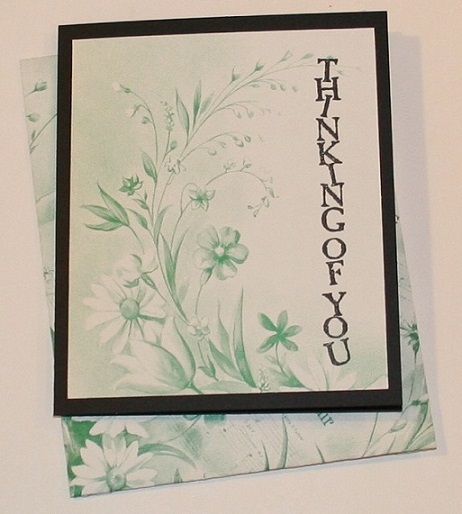 Pretty images and cute sentiment stamping.